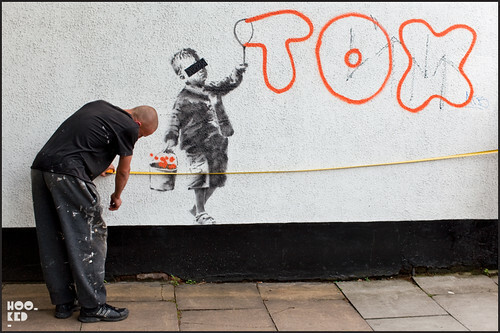 A new piece of Banksy street art appeared on the artist's website early this morning and within hours the location of the new stencil street artwork had been leaked online. 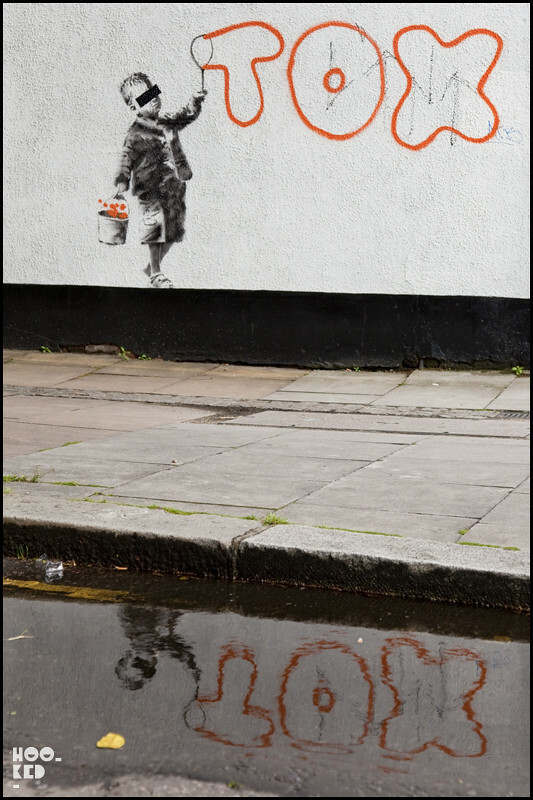 Located in Camden Town, London which is also home to 26-year-old graffiti artist/tagger TOX who is referenced in this new Street Art Banksy work. 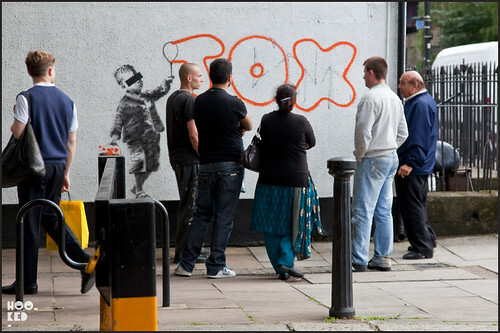 The notorious tagger was recently convicted of criminal damage at Blackfriars Crown Court, London according to The Guardian. Hookedblog headed over to Jeffrey Street in Camden ( the location of this Banksy Graffiti piece) this afternoon to grab some photographs of the new Banksy street art piece before it's defacement/destruction/ or removal. It wasn't long before a white van pulled and a measuring tape was out with workers taking dimensions of the stencil piece. The building owners turned up shortly after and as we left work had begun on boarding up the Banksy TOX piece until such time as they could find a piece of perspex large enough to cover/protect the stencil from getting damaged or tagged over. UPDATE: It looks like the boards have now been removed and the Banksy stencil piece has been covered in perspex. Measuring up the wall, a contractor hired by the building owner is measuring the Banksy piece before they cover it up with a sheet of perspex. Having made an appearance the last few years it is likely that Banksy will be at the Glastonbury Festival for the next few days rather than in London!